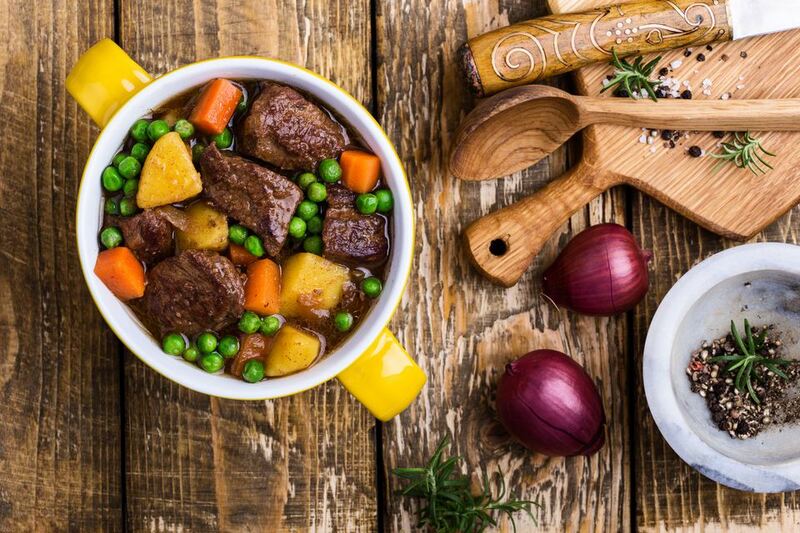 This super easy beef stew uses only five ingredients and is healthy and delicious. And it cooks in your slow cooker, which means that after you prepare the ingredients, you don't have to do any work at all! Except eat it, of course. Beef stew is a classic winter comfort food. This recipe adds tomatoes, bell peppers, and onions, but you are, of course, free to add more ingredients as you see fit. Add some creamer potatoes, some green beans, or add some chopped zucchini, yellow summer squash, or frozen baby peas at the end of the cooking time, about 30 minutes before you want to eat. The type of beef you use is up to you. Everything from sirloin tip (which isn't as expensive as it sounds) to beef chuck is a good choice. Try not to use beef sold cubed as stew meat, since it may not be of very good quality. You can also add more flavor to this recipe, although it's delicious on its own. Add some dried thyme or marjoram (marjoram is fabulous with beef), or oregano. Throw in some sliced or minced garlic, or add mustard powder or garlic powder to the stew. Beef stew is really a meal in one; there's not much more you have to add to this dish. Serve it with a nice green salad or a fresh fruit salad and some hot scones, biscuits, or rolls. Toasted French bread spread with garlic butter is another good accompaniment. Scrub the potatoes and cut each into quarters. Place the potatoes in the bottom of a 4-quart slow cooker. Mix the flour, salt, and pepper and toss with the cubed beef to coat. Add the coated beef to the crockpot. Add undrained tomatoes and beef stock and stir gently. You can thicken this mixture if you'd like by adding about a tablespoon or two of cornstarch or flour to about 1/4 cup of water or beef broth. Mix well until the flour has dissolved. Stir this mixture into the stew in the crockpot, cover, and cook on high for 10 to 15 minutes or until the stew has thickened.